Politics in Tamil Nadu has brought the spotlight on the state once again after former CM Jayalalitha’s death and the Jalikattu standoff, as the power struggle between O Panneerselvam and VK Sasikala intensifies with new twists. 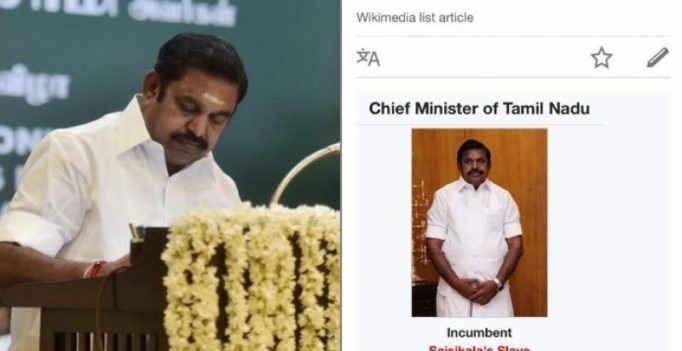 After the Supreme Court convicted Sasikala, Palanisamy from her faction emerged as the new Chief Minister of Tamil Nadu and the social media was abuzz with people wondering who he was. As many must have flocked to Google him, someone changed the name on Palanisamy’s Wikipedia page to ‘Sasikala’s Slave’. Twitter went berserk over it and images of another version also surfaced where Palanisamy was described as Mannargudi Mafia, indicating the closest aides of Sasikala. The name has been corrected now, but the political storm in Tamil Nadu shows no signs of dying down anytime soon.